Tezcatlipoca - God of the Night, Ruler of the North - Aztec God. Tezcatlipoca Smoking Mirror is the God of providence matter and the invisible ruler of the night. Tezcatlipoca ("Smoking Mirror") is the God of providence, matter and the invisible, ruler of the night. His main festival was the Toxcatl ceremony celebrated in the month of May. He is assocaited with a wide range of concepts including the night winds, hurricanes, the north, the earth, obsidian, enmity, discord, rulership, divination, temptation, jaguars, sorcery, beauty, war and strife. 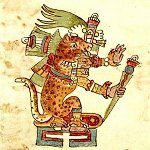 In the myth of the Five Suns, the first creation, "The Sun of the Earth" was ruled by Tezcatlipoca but destroyed by Quetzalcoatl when he struck down Tezcatlipoca who then transformed into a jaguar. The Main temple of Tezcatlipoca in Tenochtitlan was located south of the Great Temple.